The BD Loops Preformed 3/16” Saw-cut Loop Burial Safety or Exit Loop is compatible with: All loop detectors. 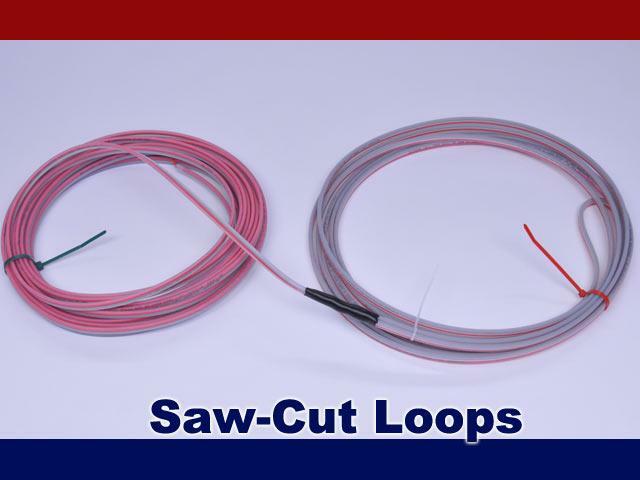 Used for saw-cut installations where a 3/16” groove is cut into the concrete or asphalt and the wire is stuffed and sealed (using loop sealent) into the surface. Custom polyethylene outer jacket protects a micro-dusted nylon coated inner jacketed 16AWG stranded wire. The saw-cut loop has a built in backer-rod securely fitting a 3/16” saw-cut groove eliminating the need to apply backer-rod to hold the loop to the bottom of the saw-cut groove and requires 30-40% less loop sealant to seal the groove. The entire loop including the lead-in fits within a 3/16” saw-cut groove preventing wasted time spent double saw-cutting or doubling blades to cut the home run lead-in. The only preformed saw-cut loop with a true installation kit designed to ensure a perfectly size cut every time. See more about the TB-Kit. Can be used with 1/4" blade. Use the TB-Kit to ensure the groove is cut exactly every time. Loop should only be installed black side up to ensure phasing direction matches.